5 BR, 3 BA, Sleeps 12. Enjoy this well equipped, spacious home, located in a quiet area close to the main village. With 5 bedrooms and 3 bathrooms (sleeping 12 comfortably) 2 families can enjoy a vacation together. 12 X 26 screened in porch off of Living-room overlooks conservation forest. Eat-in kitchen, dining room, , fun game-room with Foosball table, darts, shuffle board and ping pong. New HDTV with a new WII game system for those unlikely, but possible rainy days, and furnished exterior deck with BBQ grill. Linens can be provided for an extra charge. Full laundry available @ the house. bathroom on each of the three levels. 5 queen, 2 twins, 2 futons, 2 pull out sofas . Telephone provided but calling card needed for all calls but local, ping-pong, fuzzball table, shuffle board, darts, poker table. There are loads of games for both kids and adults including a Wii video game system. Linens are available for an extra charge ($175). This was the first time in 25 years that my immediate family has been able to vacation together. I was admittedly a little nervous about having 12 of us all under 1 roof. I cannot say enough about how perfect this house was for us. There was more than enough space for us to move about, and even hide from one another if we so desired. The game room in the basement was plenty enough to keep the kids entertained. The adults enjoyed playing cards at the large dining room table or on the screened in porch. Outside of groceries the kitchen had everything we needed to cook large meals for our family. All of us were very sad we had to leave. The surrounding landscape is very pleasing, and it is a short car ride into town. Thanks Mark, for making this an incredible experience for my entire family! I hope other families will enjoy your home as much as we did. This rustic cabin is the best hidden gem in the North Conway region! Located just north of downtown you have easy back road access to downtown so you avoid all of the congestion. We run a cycling club and for the past two years have traveled the 6 hours from Long Island, NY to cycle the endless roads the White Mountains have to offer. My club membera love it and the price is the most reasonable out there for a spacious 5 bedroom house, with laundry! And lets not forget that Mark is nice enough to allow dogs! While the guys ride their bikes I hit the trails and rivers with the pups. We can't wait to get back up there this year and in the coming years as well! My family and I had a wonderful time staying at this home. We found it clean and very well appointed. We have stayed at other places that say this but this one truly was. There were 7 of us staying here and it could have easily accommodated many more. The stove, fridge, dishwasher and microwave were all fairly new and worked perfectly. While we ate out a bunch of times we also made some complex meals here and was wanting for nothing. It rained a few times during our two week stay but the game room downstairs was plenty to keep us occupied and happy. Almost every night we would head out to the back and have a nice fire in the pit. Citronella candles and torches did a great job of keeping the mosquitoes at bay. The gas grill on the deck even had extra cylinders waiting to go if needed. Two large bedrooms upstairs, one super large one on the main floor and two more on the lower level all were comfortable and clean. A bathroom on every floor also meant no waiting to shower in the morning. Located just outside of North Conway center it is close to everything yet gave the feel of being isolated and away from the hustle and bustle of life. If you are looking for a homey comfortable place to get away for a bit this just might be the place to go. Mark is friendly and responsive to all questions and made the rental process fast and easy. This was the best vacation we've had in years. The house is fantastic. Very large and perfectly located to everything. Except for your food, it has everything you could need. The kitchen is huge and has every appliance. The dining room easily seats 8 to 10 at the table. There is more than enough seating in the livingroom and on the three season porch. And with five comfortable bedrooms and three baths, what else could you ask for. Even on the cool mornings, the house was warm and cozy. And, we were able to use the outdoor firepit on several evenings. We highly recommend this rental to everyone! We are already considering this house for next years vacation. We had an amazing vacation at this house. It's very convenient located, close to the city and all the attractions. The house is equipped with everything you might need, very clean and specious. We were 4 couples with children and had enough room for everyone. 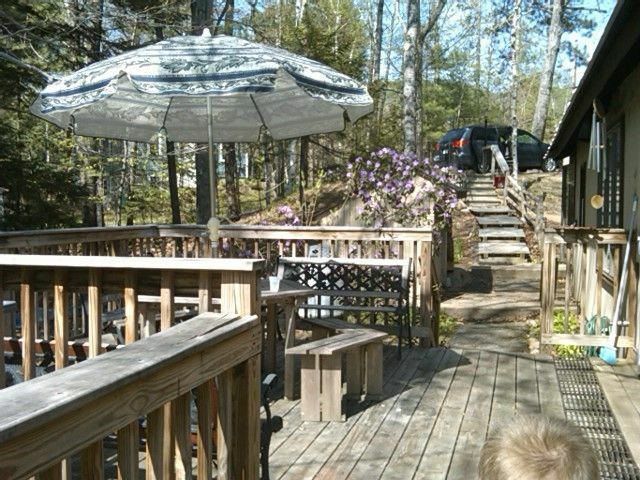 The yard and the deck are very nice and comfortable for a small group. There is nothing I can say , but PERFECT. Mark - the owner is very nice and helpful. I hope we will have the chance the meet him next time we go there. I would recommend this house to all my friends and definitely will visit again. Thank you Mark!!!! We had a wonderful stay at your house. The house was everything we expected and more! Tons of space, plenty of games, a gorgeous three season porch...I could go on. The location is perfect as well, so close to the village, but so serene and peaceful. We had 5 couples that stayed in the home comfortably and had no issues with anything. Thank you again! Close to all area amenities, Storyland, skiing, golf, mountain biking, hiking, climbing, canoeing, etc. Nearby swimming at Echo Lake State Park located at the base of Cathedral Ledge.